Trolley Tours of Fredericksburg is a family owned and operated business established in 1994. Its founder, Butch Wimmer, was dedicated to providing our visitors with the most entertaining and informative tours and transportation services available. Today, Nancy Wimmer continues that tradition of exceptional service. Nancy works closely with the general manager, Heidi Bass, who also has driven for Trolley Tours since 1997. Senior driver Mark Davis has been here since nearly the beginning, starting as a driver/guide in 1995. Additionally, Richard Schwartz, John Gaston, Kathy Quann, David Quann, Jim Warga, Diane Gray and Jim Kniseley work hard to provide safe, courteous and reliable service. 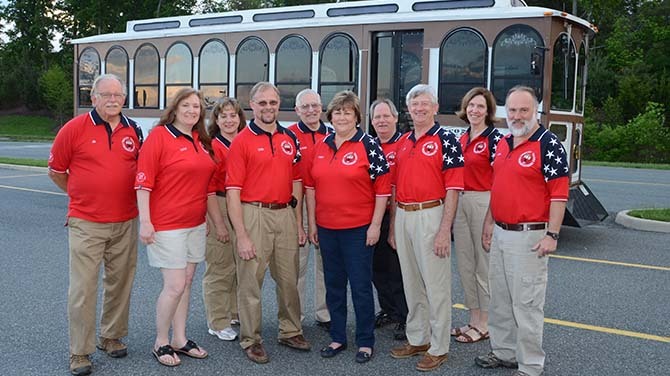 All Trolley Tours driver/guides are rigorously trained by the company and licensed as guides by the City of Fredericksburg.